Comet Industries 302353C Drive Clutch for Walk Behind Trowels and UTV's. 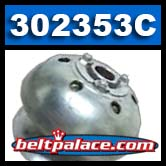 HDA Series Walk-behind Trowel Drive Clutch, Comet 302353C. Multiquip Manufacturer Part No: 11535. OEM Multiquip 11535, HDA Series 13HP Honda Assembly (Part# 5 on diagram, Rev 9). LOW STOCK. CALL TO CHECK AVAILABILITY, PLEASE!